Exactly How Much Does Jesus Love You, And So What? The Big Idea: Jesus wants a relationship with you that mirrors His relationship with the Father. We all know that Jesus loves the world. Awesome. But how does that love get split up? How much of it is set aside for you personally? You may find the answer surprising! Come see and experience for yourself just exactly how much Jesus loves you. Learn more about how to abide in that love. And learn several blow-your-mind things that happen when you do. 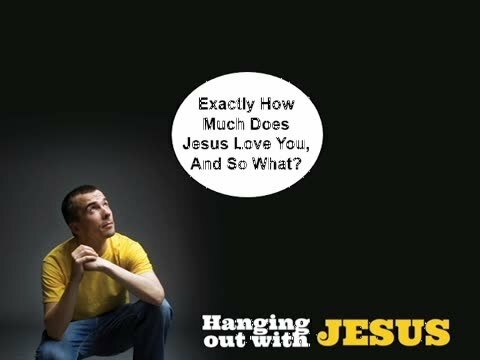 Hanging Out With Jesus: Exactly How Much Does Jesus Love You, And So What? Good morning, men! Welcome to Man in the Mirror Men’s Bible Study, where we always have room for one more man! Let’s go ahead and do a shout out. This is going to be a lot of fun this morning because we’re going to go overseas! Today’s shout out goes to 6 men who are meeting in Harare, Zimbabwe. I guess that’s the capital city. They meet on Mondays at Ron’s place using the Video Bible Study. Stan Flowers is the one who sent this in for a shout out, and there’s a picture of the guys. I also put a P.S. there; guys, we don’t have a country Director, yet, for Zimbabwe. Actually, we don’t have any country directors yet, but over the next 24 months, we’re going to begin doing some experiments and the best place to do an experiment would be where there’s somebody who might be interested in doing it with you. So just think about that in Zimbabwe! I wonder if you would join me in giving a very warm welcome to these 6 men this morning? One, two, three, hoorah! Welcome guys, we’re really glad to have you with us! Our series is Hanging Out With Jesus. We’re looking at some life changing, life altering lessons that are taking place in the upper room. When Patsy and I became expectant grandparents, other grandparents who already had their grandbabies started coming out of the woodwork, telling us just how wonderful it was going to be. I had two observations; number one, grandparents who are toward grandparents to be are absolutely the most obnoxious group of people in the world! Oh, you’re going to love it! It’s just so much fun! You won’t believe how exciting it is! And then you get to give them back, and all these things. The second observation is that they were so obnoxious that they must be right. That kind of reminded me of how Christians who are tend to be towards Christians to be. There are some things about the Christian faith that are just so absolutely astonishingly grandeur and majestic and lovely that first of all you can’t understand them until you’ve actually experienced them. Secondly, when you have experienced it, it does tend to make you seem sometimes obnoxious to your friends! 9 “As the Father has loved me, so have I loved you. Now this is a verse of scripture that I meditate on almost every day! The reason I’m doing it for myself is because this is the area where I most need to experience the reality of God, that he actually does love me. One of my big problems that I’ve always had to overcome, and I find that many men try to overcome, is that I just have a hard time believing that God really cares about me personally! So by meditating on this one verse and a few others like it, God has really changed my heart and I think that I am actually experiencing the love that’s being discussed in this text and I want you to know more about it as well. So the first circle to look at this morning is this: there is no greater love, and it will never change. This love that’s being talked about here, as the Father has loved me, so have I loved you. What Jesus is saying is that the Father and the Son have this unusual relationship, this love relationship, it also includes the Holy Spirit. We call it the trinity, God is a relationship. Since eternity past! How can you even begin to think about how long eternity is! But for all eternity, the Father has loved his Son, the Son has loved the Father, and Jesus says in exactly the same way that the Father has loved me infinitely, eternally, that’s how I love you! This is a message to every disciple of Jesus. If you are his disciple, he wants you to know today and every day that he loves you just as much! The way he feels towards you is the way the Father feels towards him. That much love! There is no greater love! Keep your finger there and flip over to John 17:23, the last part of it. He asks in this prayer that we the disciples would be brought to unity, to let the world know that you sent me and you have loved them even as you have loved me. So not only does Jesus love you as the Father, but the Father loves you like he loves Jesus! This is a lot of love going around! And this love never changes! I blogged this week why I believed Solomon was a Christian, and there’s a text in 2 Samuel where God says that I will never remove my love from Solomon. I will never ever remove my love for Solomon. Guess what? Solomon is in heaven! Someday, you’re going to meet this man. This man who tried harder than anyone else that we know about in history to find happiness apart from God! And he’s going to be in heaven, because even though he went so far astray and worshipped other Gods and all the other crazy things that he did, at the end of the day God said hey this is my much loved son. I’ll never remove my love from him. I think it’s actually almost a little easier to love children who are difficult to love. My brother Robert, who we called Bobby back then, was a troubled young kid. I quit high school, he followed my footsteps and he quit high school. He went to Vietnam, he got messed up in the head. He came back, and somebody was really hassling him and he took a baseball bat to them. He had to be defended against charges. This kid was going to go to Leavenworth if somebody didn’t do something. My mother and my father, they stepped in! They loved this kid so much they would not give up on this kid! They traveled, hired lawyers, they prayed, they begged, they pleaded and fought for this kid! They loved him more when he was going through his hard time than they had ever loved him before! God has a love for you that will never change! In fact, God is never going to give up on you. He’s never, ever going to give up on you. In the same way that you are good parents, you know that you would never abandon your children. You would never stop loving your children. There is no greater love! And it’s never, ever going to change! Why did the Holy Spirit preserve this text? What’s obviously going on here in this text? What’s obviously going on in this text is that Jesus’ love for us is very personal! He wants a relationship with us. He wants us to experience the same kind of love that he experiences. So here’s the Big Idea for the day: Jesus wants a relationship with you that mirrors His relationship with the Father. Jesus actually wants to have a relationship with you, and he wants to have it in such a way that it mirrors his relationship with the Father. Everything that Jesus is doing with you, with us, is to bring us into the same kind of right relationship with him that he has with his own Father. How Does Jesus Want Us To Respond? 9 “As the Father has loved me, so have I loved you. Now remain in my love. 10 If you keep my commands (and that might read better as by keeping my commands), you will remain in my love (in the English language this sounds like a conditional statement. It is not meant to be in the original language. So by keeping my commands you will abide in my love), just as I have kept my Father’s commands and remain in his love. 11 I have told you this so that my joy may be in you and that your joy may be complete (he wants this relationship to be fully yours). 12 My command is this: Love each other as I have loved you. 13 Greater love has no one than this: to lay down one’s life for one’s friends. 14 You are my friends if you do what I command. 15 I no longer call you servants, because a servant does not know his master’s business. Instead, I have called you friends, for everything that I learned from my Father I have made known to you. 16 You did not choose me, but I chose you and appointed you so that you might go and bear fruit—fruit that will last—and so that whatever you ask in my name the Father will give you. 17 This is my command: Love each other. So there is no greater love than this love that Jesus has for us, and the way he wants us to respond is by abiding in him. He wants us to remain in him, to live in him. He is the vine we are the branch, he wants us to remain grafted into the vine, and all the nourishment that we need, everything for life, everything to produce fruit, will come through the trunk of the vine into us. Basically, how Jesus wants you to respond is to receive his love. Then, when you are filled with love and because of the gratitude that we feel for it in response to that, we will want to obey him. We will find ourselves obeying his commands. He says my command is this, love each other. In Romans 13 it says that all of the commands are summed up in this one. If you keep this one command, you will find that you are keeping all of the others. Love each other! The height of our love for God will be demonstrated by the depth of our love for each other. The thing is that you can work hard to try to love other people, but… I’ve got a guy right now that keeps showing up at my house. Man, I’m telling you, I’m starting to find it really hard to love this guy in my own strength. I have a little confession to make; the other day he knocked on the door and I pretended I wasn’t home. I swear! I just don’t know what to do, I’m not equipped! I tried to help this guy, I got others to get him a social security card, a sort of food card and got him hooked up at the community food outreach. Several other things. He rejects it all! He wants to be poor on his own! He wants to be a beggar! I’m a little at a loss as to what to do! I can’t love him anymore in my own strength. I can’t love him as a duty. The only way I can love him is by loving Christ, by abiding in the love of Jesus. When I look at him, I actually feel something that is not natural, it’s supernatural. It’s an affection, a compassion that I feel for this guy, except last week. But it’s not something I’m doing, it’s something God is doing because of abiding in him. You get the idea. There are two approaches to this. One approach would be I’m not going to care about you until you care about me. The other approach is I’m going to care about you until you care about me. So Christ gives us this immense love that he has from his Father and then it enables us and empowers us to say hey look, I don’t care if you care about me! I’m going to care about you until you care about me! Until you care about the love I can bring to you in Christ himself. The Big Idea today is this: Jesus wants a relationship with you that mirrors His relationship with the Father. So when you think about this relationship, how does the Father love his Son? He loves him enough to give him a task, a mission, so that he can make a contribution. He loves his son enough to give him some people that he can love, teach, serve and make a sacrifice for. That’s how much the Father loves the Son, and that’s how much Jesus loves us. He loves us enough to give us a mission so that we can make a contribution. He loves us enough to give us some people that we can love, that we can teach, that we can make a sacrifice for, that we can serve. What Does His Love Produce In Us? So what does this love produce in us? We talked about how great this love is and how it will never change, we talked about how Jesus wants us to respond to that love by abiding in him which leads to obedience and leads to loving each other. What does this produce in us? Overarching, it produces the freedom of a little child. If you have had a young son or daughter, and they become a toddler, and they sense and feel the depth of your love for them, what will they do? They will begin to wander away from you. They will sense that freedom and begin to explore. But if they don’t feel that you love them, what will they do? They’ll cling to you, they’ll cower, and they won’t let you go. So here are five freedoms that come when we experience this love relationship with Jesus, when we understand exactly how much he loves us. Number one is joy, verse 11. I have told you this so that my joy may be in you and that your joy may be complete. Let me give you an example of joy, experiencing this kind of joy, the joy of Jesus. Patsy and I had a spat earlier in the week. I had some family business I wanted to talk about, I wanted to move some things around, so I walked in the room and just began talking. Here’s what I’m thinking about doing, can I get your okay on this? And she went ballistic! This woman never goes ballistic, but she went ballistic! She said okay! Okay! Okay! I’ll do it right now then! I’m thinking I came down here to have a pleasant conversation and you just ruined everything! And then I went off in a huff! Well, I got to thinking about it, and I thought I would never walk into somebody’s office and just start blabbing. In all my years, I would never just burst in on somebody without asking if they could talk for a minute. Then I realized that she had been in the middle of something herself. She would never say this, but I disrespected her, hence her reaction. So after I calmed down and had all these thoughts, I went back to her and said Patsy can I talk to you. She said sure. I said I was really out of line and I’d like to apologize and ask your forgiveness. I would never do that to anybody at the office, so I can’t excuse doing that here. She said absolutely and bam! The joy of Jesus! I’m telling you I went from the depths of despair and ready to divorce my wife over this nonsense, thinking I can’t believe I married this woman forty years ago, what was I thinking! I went from that to feeling such a depth of love and connection to this woman, and that’s the kind of love Jesus has for us! When we allow him to remain in us, abide in us, then we do things like ask forgiveness and we experience the first benefit here. The first thing his love produces in us is joy. Second item, in verse 14. You are my friends if you do what I command. I no longer call you my servants, I call you my friends. So friendship with God and friendship in general. There’s something interesting about a real friend. A real friend will tell you the truth. Recently, I just got reconnected with a guy who three years ago, as his friend, I told the truth to. He got mad about it and he basically withdrew from me for about three years. Jesus is your friend, Jesus will tell you the truth. But to abide in Jesus means we get to be his friend, we get to actually have him tutor our hearts, and tell us the truth. Then verse 15, the last half. For everything that I have learned from my father I have made known to you. So his love produces in us joy, friendship with God, and then knowledge. He tells us everything that he learned from his father. Now you, if you don’t know how much Jesus loves you, you can read the Bible and it reads one way. But when you actually have experienced the love of Christ, when you actually have the grandchild instead of just having heard about how great the grandchild is, when you actually possess the grandchild, when you actually possess this love, then suddenly these words come to life! They’re powerful! They’re real, they’re tangible! It’s not like watching it on TV anymore, it’s like being there! Then verse 16, the fourth item, you will be productive. You did not choose me but I chose you to go and bear much fruit, lasting fruit. Who doesn’t want to make a contribution? Who doesn’t want to experience the fruit of the Holy Spirit? When we abide in Jesus, we will bear much fruit. Finally, in verse 16, then the Father will give you whatever you ask for in my name. My brother Bobby, when he came back from Vietnam, was with us when we got the family together for Thanksgiving. We got together at mom and dad’s house, and my dad, the most morale man I, but a man who had never been discipled, had a simple faith, and he always prayed grace over meals. He always prayed the same prayer, God is good, God is great, and we thank him for this food, amen. But on this particular day, my brother Bobby was finally home and the family was together for the first time in many years. My father sat at the head of the table and he began to pray. Dear Lord, I just want to take some time today and pause and give you thanks, and say how grateful that my wife and I are… then he began to blubber and he couldn’t get the words out. My dad is a somewhat proud guy, he didn’t want his family to see him like this, so he excused himself and went in to the bedroom. I followed him in there and said dad what’s the matter? He said oh, it’s nothing. Your mother and I just never thought that we would ever see our family together again. He was just so grateful! He had prayed and my mother had prayed in Jesus’ name, and it was the will of God that our family would be brought back together again. It took years to happen, but this came true, the Father gave them what they asked for in his name. I always wonder how it might have been different for my dad’s life if there had been some men like some of you guys here who would have taken him under your wing and discipled him on how to be a Godly man, a Godly husband, and a Godly father. Just imagine the joy of our heavenly Father when one day he’s able to gather all of us together again. I wonder if he’s going to cry? You know how happy he’s going to be. The Big Idea here today is this: Jesus wants a relationship with you that mirrors His relationship with the Father. And the joy of that friendship is supposed to be yours by abiding in Christ. Some of you are coming to the Bible Study and you’re not quite sure about whether to embrace this Jesus, this love of Christ. So you come to the Bible Study to learn, but maybe today is the day you realize that you need to make this personal, that you need to become the Christian, not just be a Christian in waiting. Kind of like the grandparents to be, as it were. It’s time to go ahead and give this faith birth, to really release yourself to this loving Christ who wants to remain and abide in you, so you can abide in him. We’re going to close now with a prayer, and I’m going to offer a prayer. If you are among those men, whether here or online, who have not yet received Jesus Christ into your life, I’m going to give you an opportunity to do that. So let’s close in prayer. Father, our dearest Father, we thank you for this text of this immense love you have for us that. The way you and Jesus love each other is the way you and he are loving us. Lord, some of us have not really plumbed the depths of that yet because we have not yet allowed it to come to life. So if that would be you and you would like to experience this kind of love and you would like to receive Jesus into your life, let me encourage you to pray this prayer. Of course, it’s not the words, it’s what’s going on in your heart, but these words are a way that you can express this desire to Jesus. Lord Jesus, I need you. I confess that this kind of love is more like words on paper to me, it’s not something that I’m really experiencing. I know, Jesus, that you want me to have a relationship with you that mirrors that unbelievably beautiful, loving relationship that you have with the Father. I know, Lord, that I’m not going to get it by my own efforts, I’m going to need to give my life to you, I’m going to need to acknowledge my sinfulness, which I do, and invite you to come into my life, to forgive me, to give me the gift of eternal life, and to let you be the Lord of my life, and to empower me to remain and abide in you. I can’t do this on my own. I now elect to do it through you, Jesus. Amen! If you prayed this prayer this morning, I just encourage you to let someone know what you’ve done. They’ll encourage you in turn. Just as a next step, and there isn’t necessarily any one right next step, but you do want to continue in your discipleship, so continue in this Bible Study or if not here, somewhere else in a Bible Study with a group of guys. I really have never known anybody whose life has changed in any significant way apart from the regular study of God’s word on their own, and secondly, by being a part of a group of guys. A group small enough where you actually get to know each other. There’s a size of a group, a group dynamic, that when it gets to be too big you don’t really get to know each other, and so you’re not really doing life on life. But a group small enough that you’re doing life together, and then attend a worship service. You should attend a worship service every week. There’s a lot going on in the world of church configuration right now, so whether you do that in a big church, a little church, a home church, whatever, but that you are involved in a church family and you’re getting together with them on a regular basis is important. Those three things.